The field of pediatric hospital medicine has grown rapidly over the past 18 years, since the term “hospitalist” was first coined. The number of hospitalists, including pediatric hospitalists, has increased exponentially and is expected to keep growing. A tremendous amount of knowledge has been gained from critical early work in the value of pediatric hospitalists in inpatient care delivery. 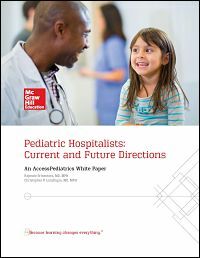 This white paper examines current and future directions in pediatric hospital medicine. Please fill out the form to download the free white paper.